This is by far my favorite coffee shop style cafe/restaurant in the area that I have tried. Excellent food everytime I've been there and the other with me also enjoyed theirs. Its reasonably cost, not dirt cheap, but not expensive either. It is generally very busy so finding a spot may be the only negative along with the early closing hours. Otherwise the food and prices are very good. I would recommend without hesitation. oak street cafe has good food for low cost. It is very spacious and clean. I had an omelette off the menu and it was very very good. 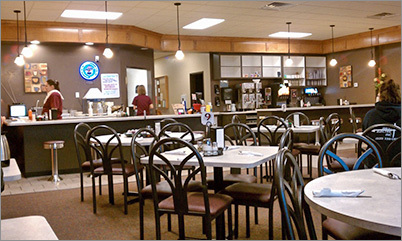 The Oak Street Cafe is a restaurant in West De Pere, which specializes in breakfast. From the outside it appears to be a small restaurant, but as you walk in I was surprised at how large it is. It has a very bright open interior with many tables for seating and two long counters on either side of the room for added dining and toward the back an extra room for private parties. It is new and very clean inside with wooden soffits, wainscoting, and dark chocolate painted walls with pretty metal and silk hangings adorning them. It is a very casual atmosphere and there are a couple of arcade machines and gambling game machines situated on each side of the door as you walk in. I ordered the Denver skillet for $6.49 and coffee for $1.29. I was brought a thermos of coffee and a plastic mug and on all the tables are condiments flavored and plain creamers, salt, pepper, sugar, and napkin dispensers. My food came pretty quickly and was hot and looked very tasty. 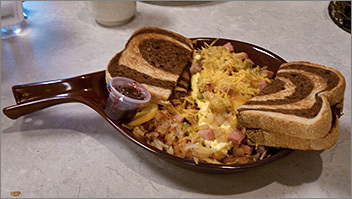 My skillet omelet was made with two eggs, ham, green peppers, mushrooms, tomatoes, and cheese served in a skillet with half an order of hash browns and two thickly sliced buttered pieces of toast - for toast you have your choice of white, whole wheat or rye, I chose rye. My eggs were made creamy and loose and loaded with thick large pieces of ham and cheese. Nothing was on the skimpy side and it tasted very good as did the hash browns. I liked the portion size of the potatoes, just enough to consume. The service was satisfactory; in addition to breakfast Oak Street Cafe also serves lunches.